We live in a world that is filled with the uncertainty of what might happen. Life Insurance protects your loved ones in the event of your death. It can provide future income to your family if you were to pass away during your prime working years, and it may also be used to pay debt, such as a mortgage, final and emergency expenses. Life Insurance is the most selfless act a person can do for their family, as the person that is insured will never benefit from the coverage. Before obtaining Life Insurance here are some things to consider. 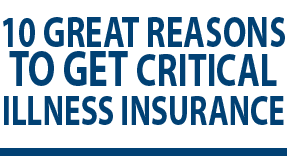 The cost of Critical Illness insurance policies will never decline, the costs will only ever increase. So the best time to get Critical Illness Insurance is now. In Canada there is a Critical Illness plan that enables you to receive a portion of your your premiums returned after a specified timeframe. Which means if a client doesn’t need to make a claim and feels they won’t, they can cancel the policy and receive repayment based on the percentage of premium paid, all the while having coverage just in case. Critical Illness coverage can only be purchased while you are healthy. Once an illness has been diagnosed you are not eligible to purchase it. 4. WILL YOU SELL SOON? Personal Critical Illness allows the insured to take the time that is necessary to recover without worry as to how the day to day expenses or additional medical services not paid by the provincial health plan. There isn’t a prearranged allocation for the payment, so all of the payout goes to the insured. You can purchase Critical Illness coverage on a mortgage, however, these types of plans only cover three illnesses such as cancer, heart attack and stroke. Alternatively, Personal Critical Illness policies cover these three illnesses as well as 22 others; all of which we hear about almost daily. In most employee benefit group plans, Critical Illness is not always offered. In the rare instance that it is indicated on a group policy, it is often not near the recommended coverage amount. Personal Critical Illness coverage allows you access to Best Doctors. Best Doctors is a group of the best Doctors worldwide that are experts in specific areas of medicine. Once a claim is made, your file is put before a panel of Doctors to review and determine whether the diagnosis is correct and the course of treatment is the best for the diagnosis. Critical Illness can be purchased to insure people from newborns and up to the age of 65. Some carriers allow you to insure children for up to five illnesses, whereas adults can be covered for up to 25 illnesses. Critical Illness policies are underwritten at the time of the application process. Meaning that we will know if the client is covered up front and not left to chance at claim time.